A flight training simulator, which has recently been installed in Dundee, will meet exacting new global standards required by the airline industry, helping tackle the worldwide shortage of pilots. Flight training organisation Tayside Aviation has recently made a £300,000 investment in the future of its students, in order to enhance the training standard of its courses and future-proof its training offering. 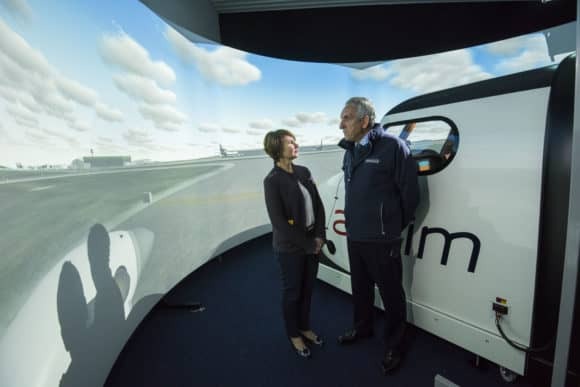 The Alsim ALX simulator is part funded by a £80,000 Regional Selective Assistance (RSA) grant from Scottish Enterprise. The state-of-the-art simulator offers a vast and diverse method of training, allowing pilots to simulate small twin engine aircraft, as well as medium range jet transport. The new, user-friendly simulator ensures the easiest immersion for both the student in training and the instructor, becoming an essential tool for decision making and a vital part of training. Having flown 33 million miles since its launch 50 years ago, the equivalent of 70 trips to the moon and back, the multi award-winning business has trained over 5,000 commercial airline pilots, 6,000 RAF cadets and flown a staggering 1,500 flying scholarships, including 300 from as far away as Hong Kong. Now certified for training by the Civil Aviation Authority (CAA), the simulator will be used by students taking part in Tayside Aviation’s BSc (Hons) Professional Aviation Pilot Practice degree, the first of its kind available in Scotland, in conjunction with Middlesex University and Aviation Skills Partnership. Launched in 2015, the degree greatly increases and accelerates students’ chances of gaining employment as airline pilots in what is a highly competitive industry. The simulator also incorporates ‘performance based navigation’ which is a new industry requirement being adopted worldwide. Described by Mr Watt as a ‘game changer’, PBN will improve the accuracy of where aircraft fly and a move to use satellite based navigation rather than ground-based navigation aids. Caroline Strain, Head of Partnerships North at Scottish Enterprise added, “This is a great example of how a small, ambitious Scottish company is using RSA funding to aid its growth and international competitiveness. By purchasing this state-of-the-art new equipment, Tayside Aviation will be in prime position to take advantage of increased demand due to worldwide pilot shortages while meeting new industry requirements. For more information, visit www.taysideaviation.com or telephone (01382) 644372.